Today would be one of the important days in the Philippines. 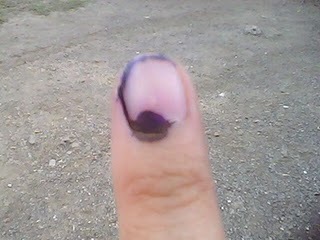 Filipinos of legal age will exercise their right to vote. I'm now in my hometown to vote. There has been problems arising for this automated elections... scary! there has been doubts for this election to succeed. Philippine politics has been known to be very dirty and bloody. In fact, at the start of filing of the candidacy, there has been a fierce and merciless killing of numerous people in Maguindanao. It has been followed by various politics-related violence. They told me that today's election won't take long because it is already computerized. Well, they are all wrong, everyone were not used to it since it is the first time for the Filipino voters to cast votes in an automated machine. The process is really, really slow. I arrived there at around 11:30am yet my priority number is already 503! Whew! I went back home to eat lunch and just returned there after several minutes. Good thing Precinct 10A has less voters and the election officer standing in front door controlling the traffic knows me! He recognized my face and my name and let me in (singit!) nyahahaha. At exactly 2:55 pm in my clock, I had successfully casted my vote. We'll just pray that everything will turn out well. God Bless and Good Luck everyone!